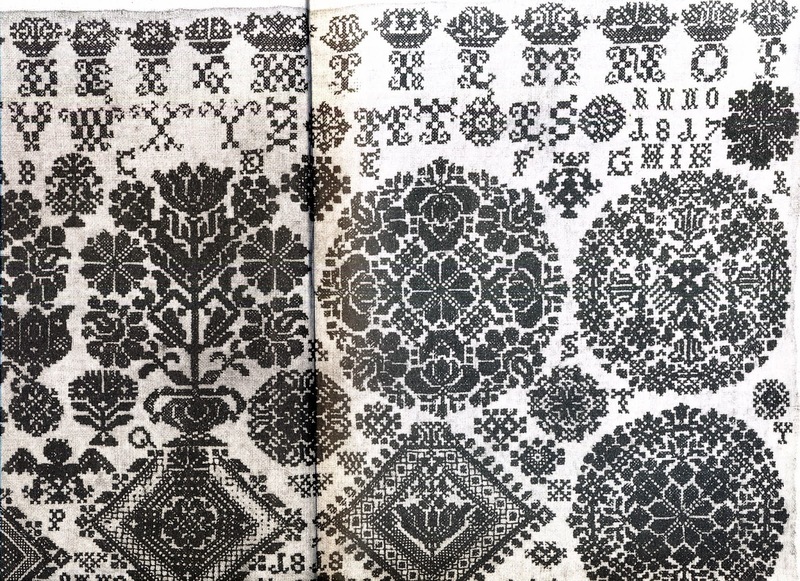 Today I will focus on a type of embroidery motif found in North Germany, specifically in the Vierlande area. This is a group of four parishes, Curslack, Kirchwerder, Neuengamme und Altengamme in the south of the Begedorf borough of the City-State of Hamburg, to the southeast of the city, on the north bank of the Elbe. The people of this area have maintained many traditions, including a very unique folk costume which features quite interesting embroidery. 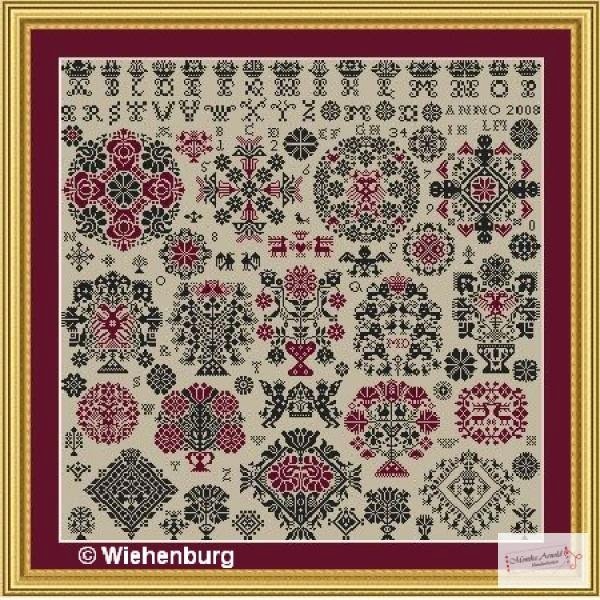 They also have an old tradition of cross stitch embroidery, which is exemplified by a few old samplers. 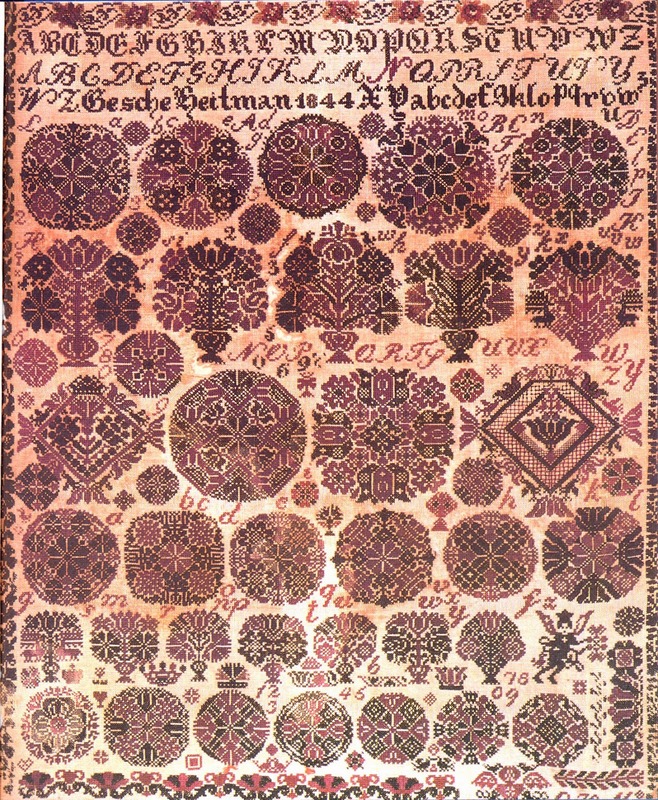 These feature mostly medallion type spot patterns, and I will show some of them here today. I will show images of the original samplers, and my graphing of some of them. Mostly in red and black, or plain black. The original color in the one sampler is burgundy and black, like this. The colors used vary according to personal taste, although red of some sort and black are most traditional. Americans tend to think of samplers as an end in and of themselves, but in fact they are a teaching and memory tool. 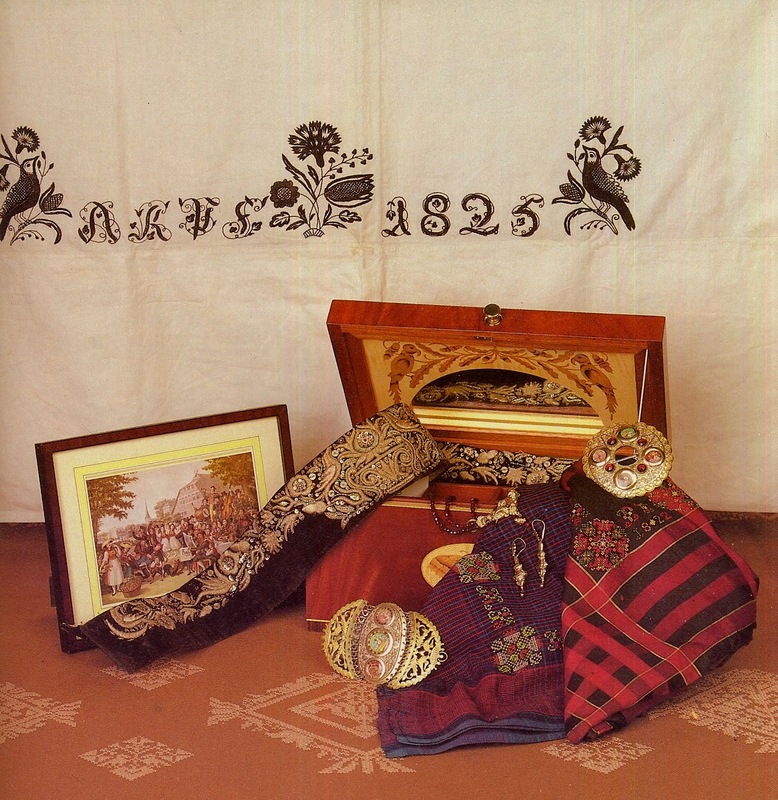 The various designs were used on household linens, and the sampler was used for reference when actually making things like tablecloths and pillows. I will present some photos of samplers from this area, along with my own graphing of some of them. Here are a couple of the samplers: The bicolored graphs are taken from this one. 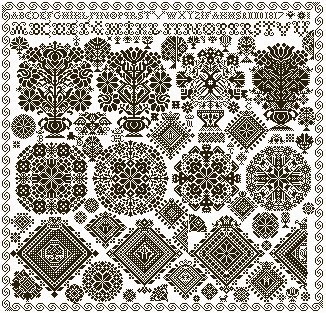 The medallion second from the left in the top row I had to modify, as it did not really work as executed on the sampler, the black motifs did not fit into the space left by the red motifs. Here is my modification of the design. Some of the designs could be considered trees of life, growing from flower pots. 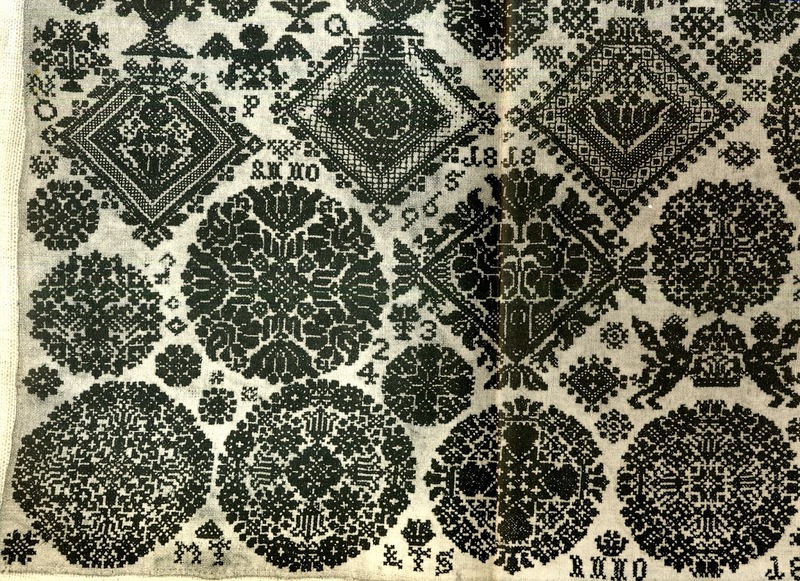 If you look at the designs, some motifs repeat many times. Roses, Tulips and carnations, among others, are visible. Some are quite round, others are rather squared off. Some of them towards the bottom are smaller, like these. 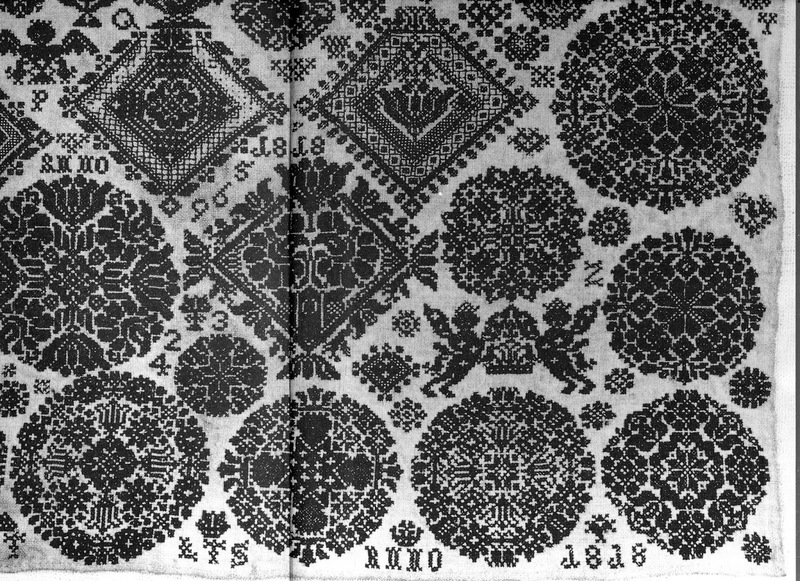 Here is another sampler, which I believe was executed all in black. I will show the 4 quarters. There is a good deal of overlap in these images. 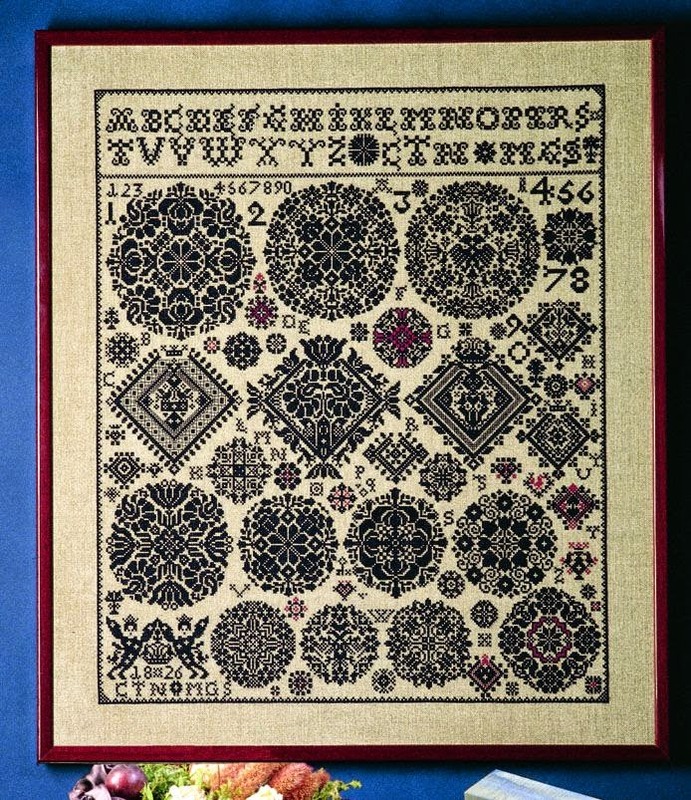 The all black medallions from above are taken from this sampler. Here are some more of these designs. These two are essentially the same design, but the second is elaborated into a larger medallion. This example features the double headed eagle, surrounded by six birds. This one features the Passion Flower. Other examples are available online if you search; like these. 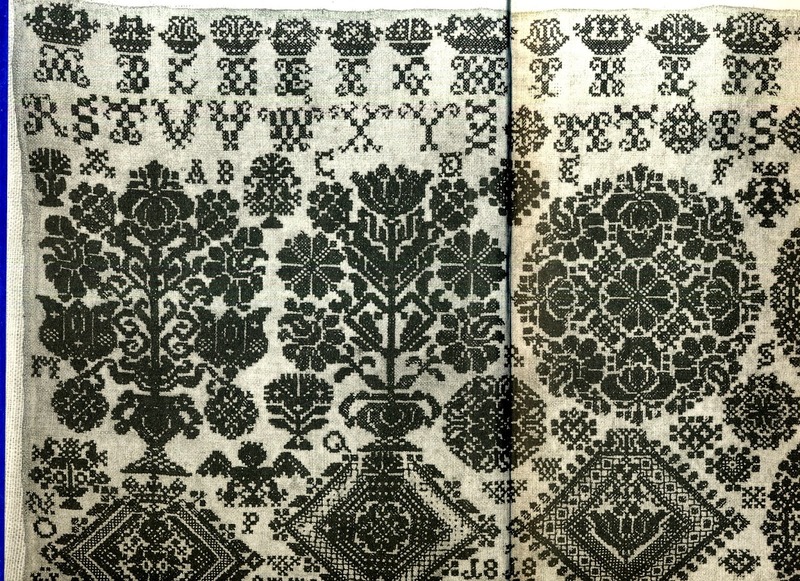 At least some of the motifs look like they were taken from the older samplers above. 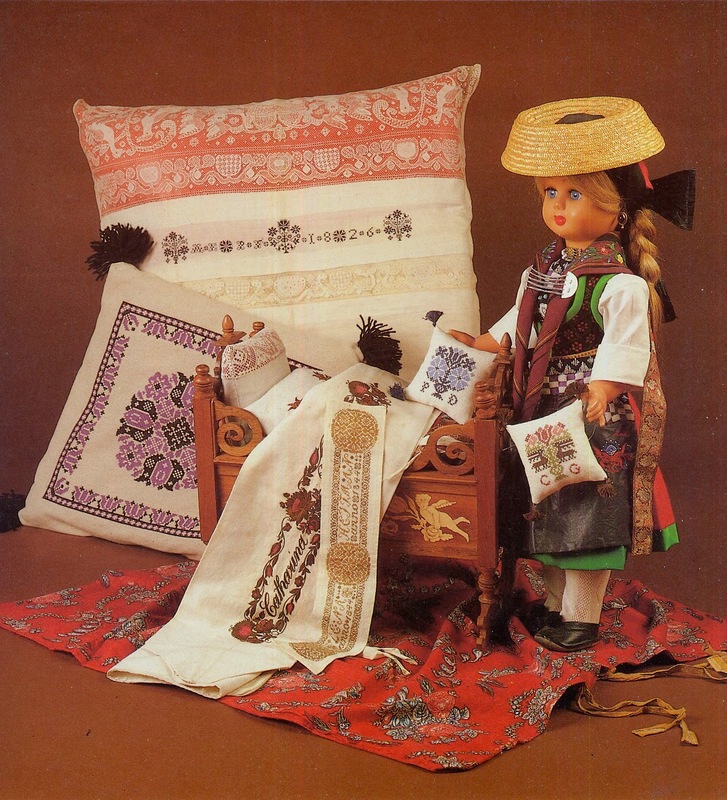 Here is a doll dressed in Vierlande costume presiding over some traditional embroideries of the area. Thank you for reading, I hope that you have found this interesting, informative, and perhaps inspiring. These designs have many possible contemporary uses. Bring a bit of German tradition into your home. Thank you, Roman :)) for taking trouble to graph and share. Classic motifs are classic motifs... Always useful. Baautiful motifs . Thanks for sharing . i'm en italian student from Florence, i'm studing fashion design and i need more information about Telemark man's and woman's costumes. do you know any website or book or other were i can find this information?